The World’s Fastest Indian is not a documentary. It was made commercially to distribute and play in theaters for entertainment—with the object to generate income through box office sales. 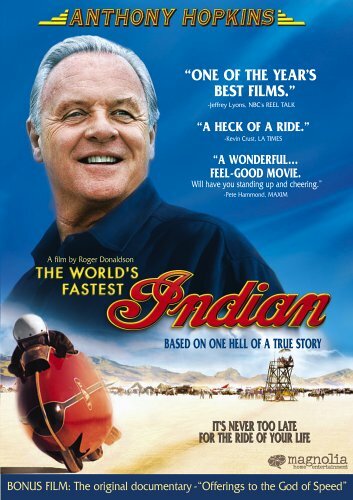 With Anthony Hopkins portraying the legendary Bert (Herbert James) Munro, the New Zealander from Invercargil with a dream to set a record at Bonneville on the Indian motorbike that he had owned for forty-some-odd years, since purchasing it new in 1920, with Diane Ladd and others in fine supporting roles—including a scene-stealing youth played by New Zealand actor Aaron Murphy—there’s much to enjoy. I frankly didn’t expect much, but went to see this film when it was first released in theaters anyway. Let’s face it; most fictional feature-length motion pictures that deal with cars and/or bikes have been pretty awful. The story lines are usually contrived, the action often improbable, and the car-guy or motorcyclist stuff is rarely right. Bert Munro’s story is a grand one even if liberties were taken by Roger Donaldson, the writer/director/producer. And we’ll clue you in with some of the real facts so you can, if it pleases you, harrumph and awe your buddies with your knowledge. But don’t let any of that detract from your watching and enjoying, because the overall take-away is structured to allow the viewer to see and enjoy all of the best bits of Munro’s story with experiences from several years of challenging Bonneville combined into one year, one adventure. Between the reality of several trips to Utah, Bert Munro did precisely what all Bonneville racers do; he kept making improvements to his machine. His mods were accomplished typical of self-sufficient Kiwis—do-it-yourself. When Bert Munro first brought his Indian home in 1920 its motor displaced 600cc. By the time he took the bike to Bonneville he had increased its displacement to 950cc. In turn he’d cast the pistons by melting down other metal bits and machining the results to fit. He hand-carved the connecting rods from a Caterpillar tractor axle and then hardened and tempered them. He outfitted the Indian with 1,000 pound, 17-plate pressure clutch and triple-chain drive. And then there was the streamlined body shell. It too was his own design and he handcrafted it. The movie portrays Bonneville’s racers and support folks in a way that pays proper credit to their competitiveness and humanity. Other vehicles shown running for records are indeed true, historic vehicles, rented from their current day restorers-owners. Indeed, for car and bike guys of any gender and age, one of the best parts of this film is the joy of seeing the Bonneville Salt Flats covered with the broad assortment of record machinery. Speed Week still provides an assemblage of one of the most unusual assortment of cars and bikes every year and director Roger Donaldson manages to capture the chaos, excitement, and adventure. No one can say for certain that two men, Rollie Free and Marty Dickerson, shown in the movie as hand’s-on helpers, ever actually knew, much less helped Munro. But each were famed salt runners on two wheels which makes their inclusion by name a nice subtlety—although it is likely lost on all but the really knowledgeable viewers. Having seen the film in its theatrical release, I knew it was one of the few car/bike movies that I would want to have in my home collection so I could see it again. It has been released by Magnolia Home Entertainment for a very reasonable price. Yes, it is a film about obsession, but it is the kind of obsession that many of us who love mechanical devices share. It’s the kind of film that you can watch on a cold winter’s evening as you dream of warm summer motorcycle rides on gleaming old machines. The movie is aptly and correctly named for although Bert and his Indian never actually went 200 mph, the class record he set, achieving 183.586 mph, on that Indian across the flat, hot, white salt of Utah, stands unbroken to this day in the streamlined under 1,000cc displacement class—Bert Munro and his Indian are indeed The World’s Fastest Indian. 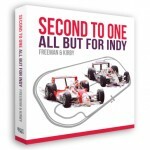 A wonderful story that even those who aren’t racing fans can honestly enjoy. You can impress your friends by pointing out that Rollie Free was the guy who went 150 miles an hour at Bonneville in 1948, lying prone on John Edgar’s Vincent HRD wearing nothing but a Speedo, bathing cap, and tennis shoes! I generally prefer a good book to any movie, but this one is so well done that it’s worth facing the challenges of the DVD player to enjoy. 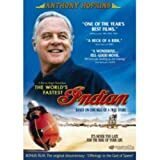 My copy includes as a bonus the original documentary film “Offerings to the God of Speed” on Burt Munro made by Roger Donaldson in 1971, in which Munro himself says that his first name is spelled Burt. The documentary is well worth having on its own, and watching it shows how well Hopkins managed to capture the personality of Munro. the DVD also has added features including a piece on the making of the Hopkins movie, commentary with Roger Donaldson, some scenes that were left out of the movie, and a short look at Munro’s hometown of Invercargill, New Zealand.